It's Shark Week on Discovery Channel, and I figured I'd cash in on the hype as well. Wrestling has had its share of shark and sea life gimmicks, so I figured I'd stroll down memory lane and share a few with you. Admittedly, I had to do a Google search to find a third shark related wrestling gimmick. Of course I remembered "The Shark" and "Shark Boy", but I had no idea there was a "Shark Girl." Thank you Internet for helping me. Let's start with the ones I know more about. 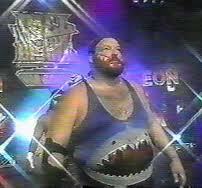 The Shark was a gimmick made famous or infamous by John Tenta. He had a pretty successful run in the WWF as Earthquake. Then when he arrived in WCW, he changed his name to Avalanche, keeping that natural disaster gimmick. Then for some reason the powers-that-be (Eric Bischoff gets a lot of blame online, but I don't know if it's solely his fault) came up with the Shark idea. Shark joined the Dungeon of Doom, which I think the only thing scary about the group was the silly gimmicks each man was saddled with. The Shark wore similar tights that Earthquake wore, but instead of the seismograph, an almost grinning shark appeared on Tenta's belly. He also had teeth painted into his beard on both sides of his mouth. Tenta went so far with the gimmick that he changed his trademark tiger tattoo into a shark. Online reports say it was a 24 hour process. That's dedication. However, the gimmick did nothing to help move Tenta any hirer than the midcard. 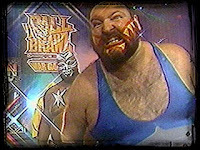 They eventually dropped the gimmick, and I think he went to just being John Tenta. He would return to the WWF in the late 90's and wear a mask as Golga in the oddities. Pardon the pun, but the shark gimmick turned Tenta into a fish out of water, though he did his best with what he was given. Rest in peace, big man. Shark Boy was NOT the son of Shark, as you might think. He's also not the same Shark Boy from the popular kids film "The Adventures of Shark Boy and Lava Girl." He was a part of TNA in the early days and mostly served as a jobber. I think it's safe to say the gimmick caught on with some fans, including my partner in crime, Chad. I remember watching those early pay per views at his place with Shark Boy and D-Ray 3000 teaming up. I enjoyed the gimmick, because in this day and age, I don't think there are enough "gimmicky" wrestlers. Everyone has a real name and lack personality as far as I'm concerned. But for some reason TNA turned him into a Stone Cold Steve Austin impersonator. While the schitck was funny at times, it got old fast as far as I'm concerned. And I don't think it was ever meant to be something to insult Austin, as I've read that Shark Boy is a big fan of the WWE legend. They say imitation is the sincerest form of flattery, but in the wrestling business, it can become annoying and stale. He swam away from TNA eventually and is making waves on the indy scene still. Shark Boy did appear on the Destination X pay per view recently, but I don't think it's lead to a full fledged return to the company. 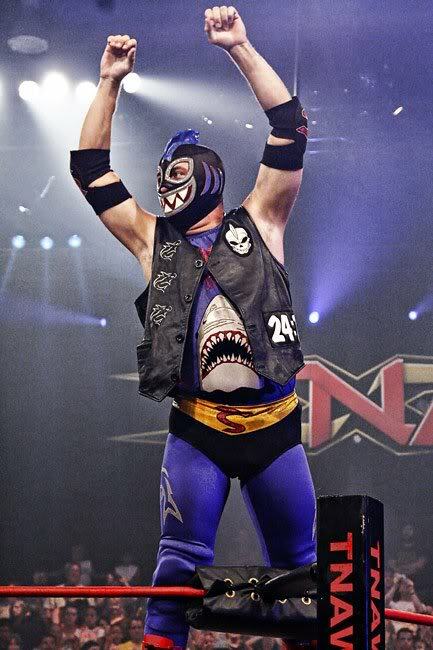 I'd be interested to see what Vince McMahon and company would do with someone like Shark Boy. I would image the gimmick would be completely scrapped. He seems to have a pretty good thing going though on the indy scene. Check out his website, it's full of Shark Boy merchandise, including masks, key chains, and t-shirts. I think Chad may even have a Shark Boy mask. You might assume that Shark Girl was Shark Boy's wife or sister. But you'd be wrong. This was another indy gimmick. Honestly, I'd never heard of her until today. Shark Girl dressed similar to her male counterpart, only in pink. She's played by "Daphne" who you may remember from runs in WCW and Impact Wrestling. I'm not exactly sure where the idea for Shark Girl came from, I would assume it has something to do with Shark Boy though. Her outfit is obviously a bit more revealing with those shark bite marks in the tights. 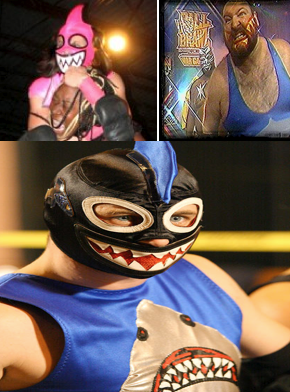 Shark Girl wrestled in different organizations, including Shimmer and CWA. From what I could find, she was most active in 2008. Shark Girl also has a My Space page, so click here to check out more photos and get more information about her. So while Shark Week on Discovery Channel is a widely popular thing, I think it's pretty safe to say shark gimmicks aren't quite as popular in the world of wrestling. 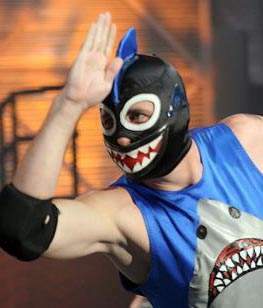 Shark Boy and Shark Girl each made the list of the 20 worst masked wrestlers on one website. Take that for what's it worth though. What are your thoughts? Post here, on Facebook, Twitter, or YouTube. Rebuilding the Tag Team Ranks?